The staff of MacLean Funeral Home Swan Chapel take great pride in being active members of our community, from involvement with service clubs and organizations, to supporting philanthropic initiatives that benefit our Island community. We are committed to providing support to two major Island institutions – the Queen Elizabeth Hospital Foundation and the University of Prince Edward Island. Over the years, we have been pleased to assist the Queen Elizabeth Hospital Foundation in their endeavours to support quality health care at PEI’s main hospital. In 2004 we were pleased to establish the Florence Simmons prize in music, in honour of our former organist. 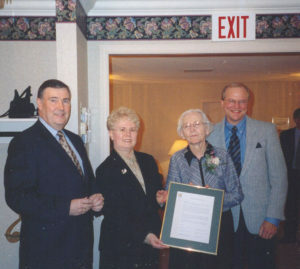 Florence helped to provide a ministry of music to all the families that MacLean Funeral Home Swan Chapel were honoured to serve from 1970 to 2001. This prize is presented annually to a UPEI music student, who has demonstrated a commitment to the advancement of the craft and artistry of organ playing, and whose overall progress is deemed most meritous. We are also committed to sharing information with our Island community through various speaking engagements. Should you wish to have a presentation for your service club, community group or faith organization, please contact us. We are proud members of the Greater Charlottetown Area Chamber of Commerce. Our association with the Chamber provides us with best practices, resources and the opportunity to engage with our community.